The Devastator is a critically-acclaimed humor publisher founded in 2009 by Geoffrey Golden and Amanda Meadows. We push the Humor genre forward with unconventional comedy books, comics, and zines. Authors include comedy writers and cartoonists stolen from The Onion, The Daily Show, Adult Swim, Fantagraphics, and Marvel. Authors also include people you have never heard of, but make you laugh so hard you will remember them. It all started with a mouse an online fundraising campaign. The Devastator: Cartoons, our first in a series of 13 humor anthology books, was published in June 2010 after a successful Kickstarter featuring a trailer video with James Urbaniak (The Venture Bros). Amazingly, strangers clicked and gave the series money on the promise of potentially being cool. 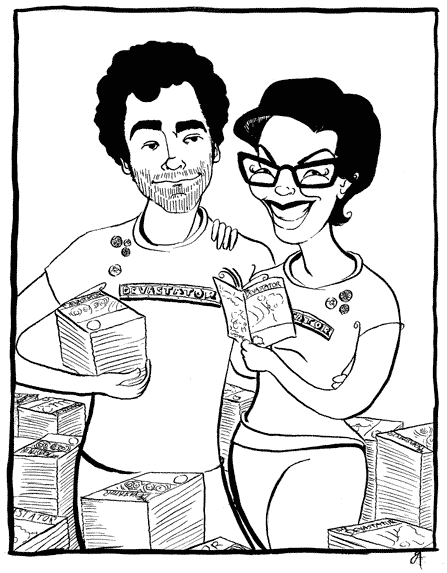 In 2013, The Devastator began publishing new, original comedy books and zines outside of the anthology series. The first of these books, Frankenstein's Girlfriend, debuted at #1 on Amazon's YA humor charts, to be followed by more Amazon bestsellers like Grosslumps, Restart Me Up, and Stay at Home Scarface. Our books have garnered positive word from Entertainment Weekly, Wired, The A.V. Club, Bleeding Cool, Nerdist, and more. In 2015, co-publisher Amanda Meadows was honored by Publishers Weekly as a "Star to Watch." Today, The Devastator publishes 12 titles per year: a varied mix of format-bending, concept-driven books, comics, and zines, many with interactive elements. Our books are distributed across the United States and internationally through a partnership with SCB Distributors. Our zines are distributed through a partnership with Disburst. We continue to tour pop culture conventions and zine fests across the country, because we enjoy hauling things.